Hortus Camdenensis | Hippeastrum x johnsoni Hort. A Hippeastrum reginae (L.) Herb. x Hippeastrum vittatum (L’Hér.) Herb. hybrid. Flowers deep dull red, the keel striped white. [RHSD, Baker Am.]. ‘The broad-leaved species of Hippeastrum hybridise with great facility, and the original hybrids can be easily intercrossed. Since the year 1799, when H. Reginae was first crossed with H. vittatum by a watchmaker in Prescot, in Lancashire, called Johnson, after whom the hybrid was named, a very large number of beautiful types have been produced.’ [Baker Am.]. Bury pl.1/1831-34. Desideratum to Loddiges’ Nursery on 6th January 1845. [MP A2933-2, p.28]. 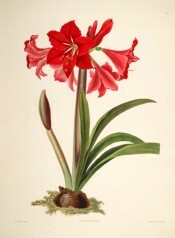 Listed as Hippeastrum reginae-vittata in both the 1830 and 1836 Loddiges’ Nursery catalogues, copies of which are held at Camden Park [CPA], and this is presumably where Macarthur obtained his information. I have found no further record of this plant. In Australia the name Hippeastrum johnsoni is often given to hippeastrum hybrids that conform to the description of the true H. x johnsoni regardless of parentage.